I have a long history of enjoying Chik-fil-A's sandwiches. We didn't have any stores where I grew up in Tifton, Georgia. (Tifton didn't have a fancy mall--which was the only place you used to be able to find Chik-fil-A . . . back before they began expanding into stand-alone stores.) The closest Chik-fil-A to my hometown was 45 minutes away in Albany. As a boy, I usually went to Albany only to make my semi-annual visit to the orthopedic surgeon that oversaw my leg surgeries and therapies. I asked Mom if we could eat lunch at the Albany Mall so that I could have my favorite chicken sandwich after the doctor's visit. The chance to eat their chicken sandwiches as a special treat. Now I can get a Chik-fil-A sandwich whenever I choose. (Note that I've tried the McDonald's "Southern" chicken sandwich and it is a pale pretender to the delicious flavor of the original Chik-fil-A offering.) But I am NOT going to go to Chik-Fil-A for lots of reasons. 1. I don't agree with Mr. Cathy's religious views on homosexuality. 2. I would rather he didn't use his resources to actively slow the efforts to improve the civil rights of homosexuals in the United States. 3. I don't want to support the corporation Mr. Cathy heads, in an effort to make my own small statement about what I believe is a discriminatory point of view. 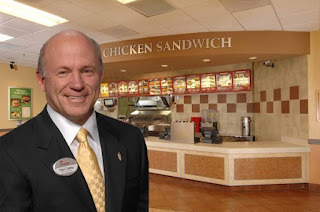 I also know that most of the franchise owners of Chik-fil-A restaurants are individual owner/operators and are only tangentially connected to Cathy's corporate structure. Still, I think a statement can be made. I am saddened and dismayed by the outpouring of "support" that this past Wednesday's Chik-fil-A Appreciation Day and what I think that continues to demonstrate about the state of equality in our country. Many people say that they stood in line to support free speech, but I believe that the free speech being supported discriminated against a "different" group of American citizens. I stand for the notion that everyone deserves equality. The push of history will eventually bear me out, I think. The kid in my memories misses the taste of those sandwiches, but I, like our culture, have changed since then. I would like it to change a little bit faster.